If you’re looking for a vegan replacement for tuna salad, look no further! This healthy, plant-based Mock Tuna Salad uses garbanzo beans and tahini. Even better, this Ocean-Friendly Mock Tuna Salad skips the vegan mayo and uses white miso, grainy mustard, and sweet pickle relish for flavoring instead. There is some added salt and sugar from the spices, but I think it’s worth it to re-create an easy, delicious alternative to a real tuna salad. I really miss eating tuna, but this recipe takes me back to my childhood when this was a lunchtime favorite. I didn’t even miss the mayo! I can’t tolerate most fish anymore due to a restricted diet, but I’m also concerned about mercury and other contaminants in most fish anymore, including tuna. Getting those omega-3s is important, though, so I do take a supplement to help keep my hormones balanced and fight off depression. I’d love to know if you have an algae-based omega-3 supplement that you love? I’m always looking for suggestions. 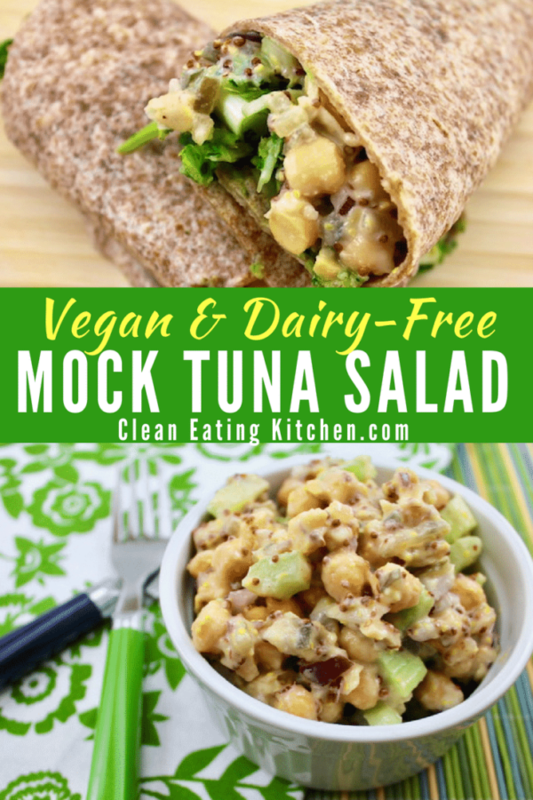 As a serving suggestion, you can either wrap this Vegan Mock Tuna Salad in a tortilla like I did yesterday for lunch, scoop it onto toast, or serve it plain or over crisp romaine. 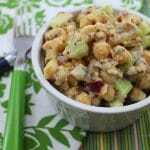 The celery and onion provide characteristic crunch, and the gently-smashed garbanzo beans give a nice texture. A fresh and easy salad that replaces a traditional tuna salad. This is a healthy vegan version. Rinse and drain garbanzo beans and place into a medium-sized bowl. Chop celery and add to bowl. Add tahini, relish, mustard, miso, and onion to the bowl and stir to combine. Use the flat side of a fork to smash some of the beans. 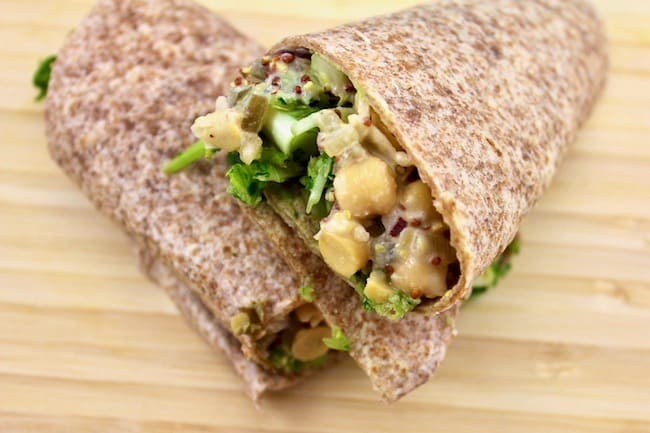 Serve over chopped romaine as a salad entrée, wrapped in a tortilla for a wrap, or on toasted bread for a sandwich. I hope you enjoy this recipe as much as I did! This has quickly become a favorite in my household. Looks fantastic Carrie! Is that wrap gluten free? Hi Suzanne! I was cleaning out the fridge and used a wheat and corn tortilla from Trader Joe’s, but generally I like to use the brown rice tortillas from either TJ’s or Food for Life. Thank you for the recipe! I used to eat “Tuno” a vegan tuna substitute, but they quit making it. I love sandwiches in the summer, and this looks great. 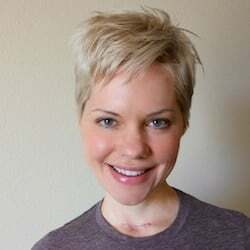 I really enjoy your blog and recipes; thank you for sharing! Thanks for the recipe. I will think of it as “chicken” salad since I don’t like tuna. Have a blast at the getaway, you lucky duck. I look forward to hearing about it. And congratulations on getting the first draft done! That’s huge! I like to think of it that way too! 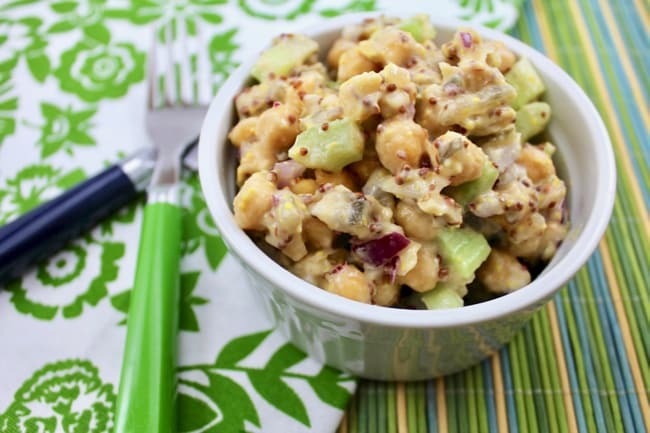 For some reason I think homemade chick peas, in this recipe, really make it taste like a chik’n salad. I think you’re totally right, Lairel. You could probably add some dried fruit to make it taste more like a traditional chicken salad as well. This “tuna” salad sounds absolutely awesome! I LOVE chickpeas :). I love how simple and clean this recipe is! I’m vegan, and my husband is not, but we agree that tuna from a can is just too sketchy. I look forward to sharing this with him! It looks perfect for a work-day lunch. Have a fun time in San Diego!!! The recipe sounds so good…I will be making it soon! Where can you buy white miso?! I went to fresh market and they didn’t have it :/ Do you have any suggestions. It would be in the spice section correct? Hi Ally! The white miso I got was in the refrigerator section at the health food store. Yum – i love the look of that ‘tuna’ salad! The pickle relish addition sounds great, I’d love to know which brand you use. Have fun in San Diego – I wish I could go! Oh my goodness Carrie – this sounds super delicious! I love that you skipped on the mayo, I used to love it when I first went vegan, but it’s not super healthy and I rarely eat it now. I don’t have miso… I should get some. I also like that it’s nut free (much lower fat than other recipes out there). Hope you have fun at the getaway! I made this for my family for dinner tonight and it was a real hit (except for my older daughter but I think it was the texture that she didn’t like) LOL. Anyway, I had my husband try a bite before dinner and asked him what it reminded him of. The only hint I have gave him was ” Think non-vegan” and he answered with “tuna or chicken salad.” Score! I couldn’t find whole grain mustard but mixed dejon and spicy. Came out great! Thank you! Yay!!! Thanks for letting me know, Kelly. Somebody recommended breaking up a sheet of nori (seaweed) and adding that to the mix for an even more authentic tuna flavor. I just downloaded your app. FYI – I found it in the App Store , not ITunes . One thing I’m missing from your recipes is calorie and nutrition break down . Do you ever include that? I finally got a chance to make your mock tuna salad – it’s delicious. The tahini definitely gives it a distinct flavor. Thanks for another great recipe.